TheNewVote.com is a location-based SMS polling system and place to post photographic proof of election day votes. The election process should be simpler and more transparent. 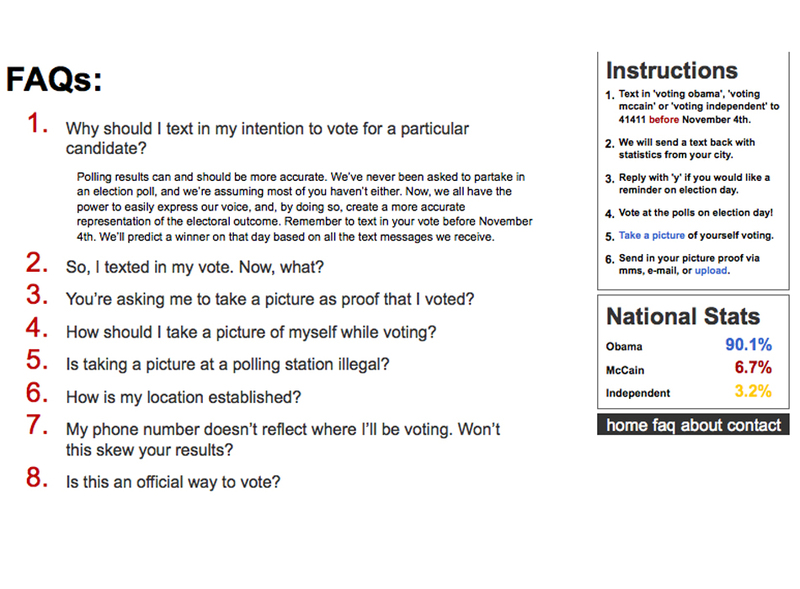 This website allowed people to declare their voting intent as well as to prove their actual vote on election day. Every voter’s opinion should matter when it comes to the presidential election, and this site gives individuals the power to create a higher resolution representation of the electoral outcome. Also, as vote tabulation should be efficient and error-free. The election result should not be subject to any chance of fraud or manipulation. Asking individuals to create photographic proof of their vote helps to keep the established voting system honest by adding a new user-generated layer of checks and balances. The New Vote was created by Che Wei Wang, Alex Abreu, and myself.